Writing a script is fun. Formatting a script? Less so. Many an idea can be paused or squashed entirely when you’re focused on making sure your character headers are properly centered. Film industry favorite Final Draft attempts to automate many of these hassles, but the program is still somewhat chaotic for those looking to simply write. 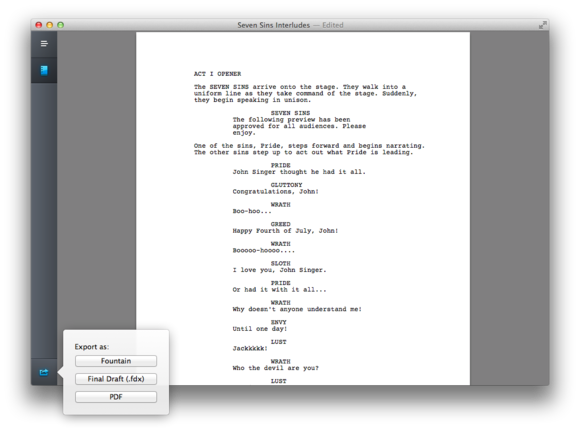 Once you're finished working with a script in Highland, you can export it to Final Draft or PDF format. Highland’s big appeal comes not just from its minimalist writing interface, but its conversion capabilities. The app can import a text-based PDF or FDX (Final Draft) file and translate it into editable Fountain text without losing your initial formatting. You can likewise export a Fountain file to a PDF or FDX file once you’re ready for an inital reading or more-advanced formatting. The conversion to and from FDX is what gives Highland true legs in the filmmaking community: While it’s great to be able to write without Final Draft’s toolbar in the way, the screenwriting app has many powerhouse features essential to professionals when prepping secondary and final versions. Highland is thus very clearly designed as a supplementary tool, rather than an outright replacement for Final Draft. That’s not to say that students and budding filmmakers can’t solely use Highland to produce their work, but if you need some of Final Draft’s advanced tools—templates, revisions, outlining, scene view, Tagger—you’re going to want to export it from Highland and move it to Final Draft. I tested Highland’s import process on several screenplays—both Final Draft and PDF format—and I was pretty pleased with the results. The app translated most of the scripts to Fountain flawlessly, with only a few goofs—for example, the page breaks of one PDF, when translated, resulted in an extra character line with no dialogue. Scripts formatted in Final Draft’s play format are a little trickier for Highland: It doesn’t quite know how to format these lines, and character slugs run next to dialogue. In situations like this, I wish Highland offered some sort of batch-change option; it includes support for OS X’s basic Find and Replace feature, but that tool doesn’t quite offer the flexibility to quickly fix an entire script’s formatting issues. 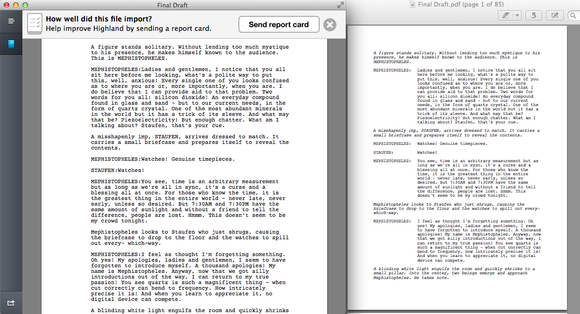 Try to import a PDF of a play’s script, and Highland has a little bit more trouble, but it's still readable and usable. Highland can’t process certain types of imports. For example, it can’t import PDFs where the text is embedded in images, rather than in PDF text (though you can run such PDFs through a third-party OCR app such as FineReader, and then use the resulting file with Highland). 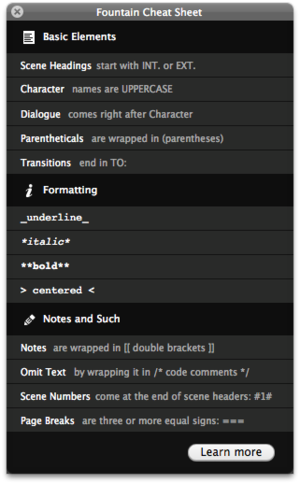 The app also can’t import starred revisions, A/B pages, and other advanced options present in some Final Draft files. Once you’ve imported your script (or started a new one), writing and editing in Highland is a pleasure. The experience is very similar to writing in a Markdown-powered app such as Byword: There are only four buttons in the window—Jump to Page, Edit mode, Preview mode, and Share/Export—leaving the rest of the window bare to help you focus. Make the app full-screen, and you have an even larger canvas with which to do your work. Can't remember the Fountain syntax for a scene heading? Highland's cheat sheet has you covered. There are also a few other perks for writers, including a Dark mode for writing during the evening hours, an invisibles toggle, and a Fountain-syntax cheat sheet that offers a list of the most-common Fountain notations, including scene headings, character, dialogue, parentheticals, transitions, text formatting, and more. Click the Learn More button at the bottom of the cheat sheet, and you’ll be sent to Fountain’s website, where you can study every bit of the syntax in depth. Highland currently doesn’t include iCloud support. If you want to sync your Highland scripts between devices, you’ll have to use a third-party sync service such as Dropbox. As someone who often dabbles in script-writing, I really liked spending time with Highland. I personally don’t need something as full-featured as Final Draft for my script snippets, but I appreciate being able to export my words into other formats for friends and co-conspirators who may be editing or viewing them. Highland’s import tool is also quite good, though it still has a few kinks to work out. I have full confidence that with enough reports and some time, the team behind Quote-Unquote Apps will get most of the bugs worked out.